This is one of my all-time favorite early Spring recipes. It is so bright, clean and colorful and pairs really well with grilled or seared chicken or halibut. This was a popular dish at Chez Panisse, and I've continued serving many variations for clients over the years. It's really fun to play around with this relish—adding chopped toasted almonds or hazelnuts adds a great crunch, and you can even swap out the kumquats for diced Meyer lemon (peel and all). Set a medium pot of water to boil. In a large bowl, make an ice bath with ice and cold water and leave it near the stove. In the meantime, add shallots and vinegar to a medium bowl. Let macerate for about 10 minutes. This takes the edge off of the shallots while flavoring the vinegar. 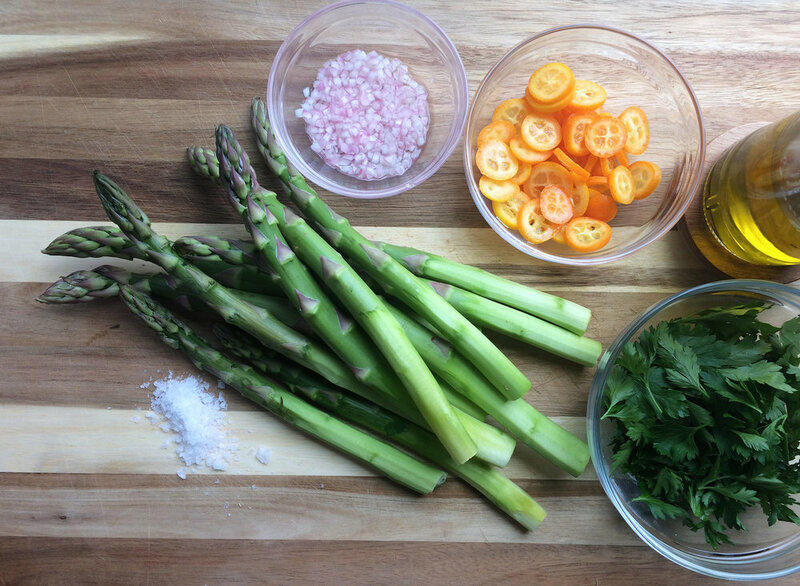 While asparagus is cooling, add sliced kumquats, parsley and olive oil to the bowl with the shallots. Toss to mix and season with salt and pepper. Pat dry with a paper towel and top with generous spoonfuls salsa. Kept separately, this will keep for up to 3 days. I layer the salsa for clients so it stays super bright: start with the shallots and vinegar, then add the kumquats and oil, and top with parsley leaves. Drizzle the asparagus with a little olive oil to keep them from drying out. To trim thick asparagus, cut off the bottom inch or so then use a sharp peeler to remove the thicker skin on the lower half of the stalk. For thinner asparagus, just snap off the bottom inch or two of the stalk—it will break naturally where it's more tender.